As a young girl, Erica dreamed of one day starting her own business, which became a reality in 2010 when she started NeuBleu Interior Design. Erica was born and primarily raised in Santa Fe; however, while living in Long Beach, San Francisco, and Denver, she was influenced by the distinct designs cultivated in different parts of the country. Her approach is simple…she works with each client to determine their personal style and integrates her love of Traditional, Modern, and Art Deco with a bit of a French influence. Erica uses textiles, antique materials, and unique surfaces that combine each space into a warm and functional interior. She not only works on the décor of homes, offices, studios, outdoor living spaces, and commercial projects, she also designs new and remodeled kitchens, baths and closets. 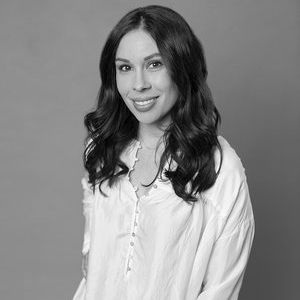 With a Bachelor’s Degree of Interior Design from the Art Institute of Colorado, coupled with 10 years experience, Erica’s is a well-rounded and respected designer whose expertise has evolved to a level that appreciates diversity, fine art and the details that turns a good design into a great design. Creating a space utilizing black and white was a welcome challenge. We drew from nature to create additional interest with texture, color and pattern. We are thrilled to present our perspective on the Study in this luxurious home.